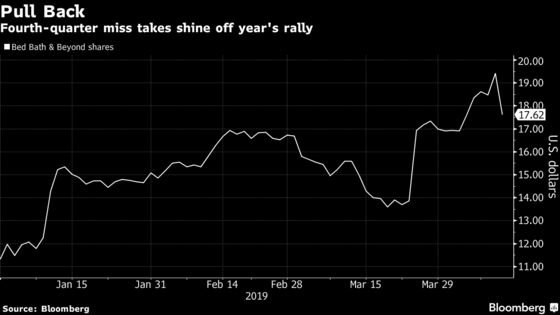 (Bloomberg) -- Bed Bath & Beyond Inc. sank the most since September after the company’s rosy full-year guidance failed to persuade the Street of improving trends as fourth-quarter comps and sales missed estimates and the retailer’s first-quarter earnings view also fell short. The company remains a “show me story,” Loop Capital analyst Anthony Chukumba said. Wells Fargo stuck to its bearish rating, noting the lack of evidence for a turnaround. Others remained on the sidelines, awaiting a plan from activist investors, who called for new leadership following the earnings report. Shares slumped as much as 12 percent, the most since Sept. 27, as the S&P Consumer Discretionary Index was little changed. All eyes are on the activist investors, but the prospects of a turnaround are low and not imminent amid a dependency on coupons, inferior pricing and weak store traffic comparables. “Expect the battle to continue” at Bed Bath & Beyond, said Baker, who remains on the sidelines. He expects the downside is “somewhat limited” in the near-term with activist investors likely unveiling their plan in the next two weeks. As for the results, he said the quarter was relatively in-line, and the increased guidance is “back-end weighted” by a weaker-than-expected first quarter. Bulls will focus on activist investors and the long-term transformation as two ways to win, but bears will hone in on the year-to-date share rally on unproven initiatives put forth in the guidance. Citi is still skeptical of the full-year guidance. Though the company’s outlook and turnaround plan appears encouraging, “there’s little tangible evidence” that trends are turning. It’s yet unclear how the company will cut costs and unprofitable areas without a further deterioration in sales, and he asked whether it’s prudent to increase buybacks instead of using capital to test initiatives. The retailer has “optimistic long-term targets with low visibility and high execution risk,” Gutman said, adding that he remains skeptical of the new targets as macro and competitive headwinds persist. The weak first-quarter guidance increased his skepticism around the full-year guide. And, he said, the stage is set for a proxy fight later this year as the company may not have conceded enough to placate activists. “Bed Bath & Beyond’s ongoing investment in technology and promotions, amid rising competition and at the expense of margin, has yet to lift traffic and sales and suggests more investment may be value-destructive, evidenced by falling ROIC."